KR Creative Agency is a young, energetic and fast-growing design, development & marketing agency, based in New Delhi, India. 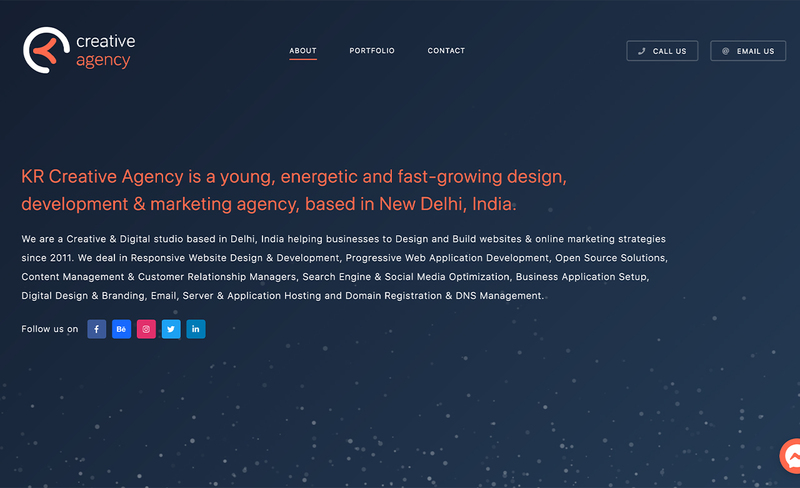 We are a Creative & Digital studio based in Delhi, India helping businesses to Design and Build websites & online marketing strategies since 2011. We deal in Responsive Website Design & Development, Progressive Web Application Development, Open Source Solutions, Content Management & Customer Relationship Managers, Search Engine & Social Media Optimization, Business Application Setup, Digital Design & Branding, Email, Server & Application Hosting and Domain Registration & DNS Management.